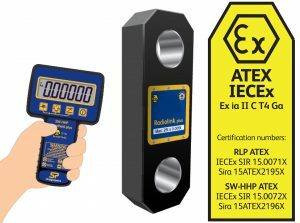 We have expanded range of ATEX Load Sensors and Dynamometer products conform with a new directive—2014/34/EU—that becomes effective today (20 April 2016), updating 94/9/EC. At the turn of the year, the force measurement, load monitoring and suspended weighing load cell equipment manufacturer launched an ATEX and IECEx version of its most popular product, the Radiolink Plus wireless load cell, which met Zone 0, 1 and 2 hazardous area classification. An ATEX version of the wireless Handheld Plus followed, while other wireless products including compression cells, shackle cells, load pins and the Running Line Dynamometer (or TIMH), part of the manufacturer’s tension in motion range, are also in accordance with the new 2014/34/EU directive and boast classification in the three zone, including 0 (an area in which an explosive gas atmosphere is present continuously or for long periods)—unprecedented in wireless below-the-hook force measurement technology.